Butternut squash is a member of the cucurbitaceae family which includes squash, melons and cucumber. All have a thick rind surrounding a fleshy interior with a pulpy seed-containing core. Varying amount of water, fibre, sugar and starch in the different types of cucurbitaceae give them their widely varying characteristics. Guest blog by Susan Aldridge, freelance writer and editor based in London, with an interest in medicine, health, science and food/nutrition. 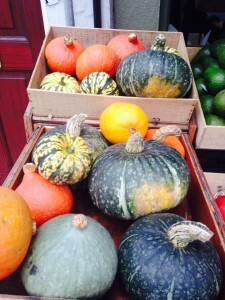 As far as I’m concerned, butternut squash is the only edible type of squash, although the fact that squash come in such a wide variety of shapes, colours, sizes and patterns makes a collection of them a signature sign of Halloween, Bonfire Night – and winter to come. Butternut squash contains more vitamin A than any other commonly consumed fruit or vegetable. A 100g portion will give you over 300% of the recommended daily amount. It’s also rich in beta-carotene and lutein which, like vitamin A, are powerful antioxidants, which can help protect against a range of cancers and are also important for eye health. Finally, butternut squash is rich in soluble fibre, which help improve insulin sensitivity and keep blood glucose low. It’s hard work processing a whole butternut squash, so I do tend to go for packaged slices or cubes – not the ‘greenest’ choice, I know, but when time is short it does help to have some of the prep done for you. This is a warming soup, packed with healthy spice, which would go down well at a Bonfire Night supper. Fry the vegetables with the spices in coconut oil for 5-10 minutes. Then add the water and bring to the boil. Add Marmite and tomato puree to flavour. Cook for 20-30 minutes, till the squash is soft. Blend and serve with a squeeze of lemon. I’ve noticed a lot of superfood salads offered in pubs and restaurants have butternut squash as an ingredient so I thought it was time to give it a go. The seeds add crunch, the cranberries/blueberries a touch of sweetness and then there are the usual ‘green’ suspects to pack this salad full of nutritional goodness. Half packet of butternut squash slices, roasted and cooled (you can use the other half, hot, in the roast recipe below). 1 tbsp extra virgin cold-pressed flax seed oil (I always use oil from The Linseed Farm but any other healthy oil would be fine). Mix all ingredients in a large bowl. For the dressing, crush the garlic with the mustard powder in a mortar and pestle to form a puree. Then add the vinegar, lemon and oil and whisk. Toss into the salad. This is an attempt to put some extra colour into a vegetarian roast dinner, and to give red cabbage and Brussels an outing other than during the festive season. Start by preparing the cabbage (this is the recipe I use every year on Christmas Day, adapted from Delia Smith). Shred a red cabbage, chop two apples and two red onions. Layer these and sprinkle cinnamon over the top. Add about 3 tbsp dry cider. Bake for 2-3 hours at in a medium oven. Roast the squash till soft. Serve with sprouts and the tomato sauce as a gravy. If you like, sprinkle the squash with grated blue cheese five minutes before the end of roasting. Courgette plant – the flower opens up and the courgette grows from its centre. 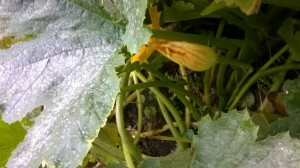 Guest blog: I’m told that courgettes are laughably easy to grow. Not so in my experience. I tried, and not a single seed poked its head out of the soil. Still, this is my first year of vegetable growing so maybe I’ll have better luck next year. The point is, that you may end up with a glut of courgettes at this time of the year so, are they good for you and what should you do with them? By guest blogger, Dr Susan Aldridge, freelance writer and editor based in London, with an interest in medicine, health, science and food /nutrition. OK, so this member of the family that also includes marrow, squash and pumpkin is not a traditional superfood! It is mostly water, which makes it low in calories and also means it is worth drawing out some of the water by salting slices in a colander and leaving them for half an hour or so and then mopping up some of the moisture with kitchen towel. This is particularly so if you are cooking with larger courgettes (if you are growing them, pick them small, where they have more flavour). Aside from the water, courgettes are a reasonable source of vitamin C and are also rich in soluble fibre, which can improve your insulin sensitivity. A high-quality greengrocers will offer a range of shapes, colours and sizes of courgettes to add interest to your recipes. I used yellow cylindrical courgettes and round green and cream striped courgettes for the ratatouille recipe below. A complete vegetable juice – I wouldn’t normally juice courgettes, but this is a way to use them if you have a glut in the garden. Add to your juicer and drink immediately. Remove water from the courgettes, as described above, then gently fry the garlic in the oil for a couple of minutes till golden. Add the courgettes and fry till golden brown (about 15 minutes). Allow to cool and then add the deli ingredients. Ratatouille has long been one of my favourite summer dishes, because it is so versatile. Serve with wild rice, pasta, grated cheese, baked potato/sweet potato – hot, warm or cold. Note, I do not use aubergines purely because I am not keen on them- but feel free to add (use like the courgettes, draining off the water). Fry the onions in coconut oil until tender (about 10 minutes) and then add all the other vegetables. Bring to simmer and cook for around 40 minutes with the thyme. Finish with the torn basil leaves and a slug of flax seed oil. By our guest blogger, Dr Susan Aldridge, freelance writer and editor based in London, with an interest in medicine, health, science and food/nutrition. The winter months are a good time to turn to the cruciferous vegetables like cabbage, broccoli, kale, cauliflower and Brussels sprouts, for your daily helpings of greens. Watercress is also a crucifer, but comes into its own later in the year. The crucifers have long been known for their health benefits but modern medical research has put the focus firmly on their anti-cancer properties. Studies have suggested that it is the crucifer content of a diet high in fruits and vegetables which helps prevent cancer. As well as containing polyphenols, which are found in many other fruits and vegetables, the cabbage family are particularly high in another group of phytochemicals known as the glucosinolates. When a cruciferous vegetable is cooked or eaten raw, the glucosinolate content breaks down to give two very potent types of anti-cancer compound – the isothiocyanates and the indoles. 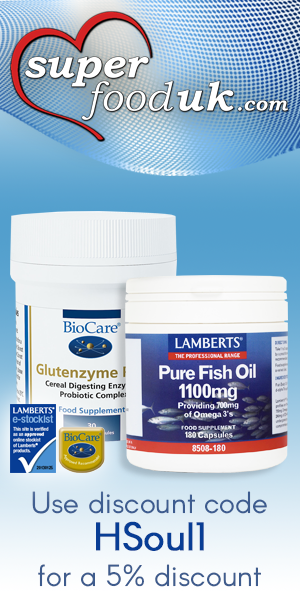 However, the glucosinolates are very water soluble and the enzymes that release the anti-cancer compounds are very sensitive to heat. Therefore, overcooking cruciferous vegetables destroys most of their health benefits. 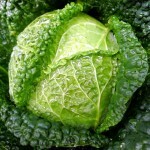 This is why my recipes this month call for briefly cooked, or raw, cabbage. I can’t quite bring myself to juice cabbage. It’s illogical, I know, as I am quite happy to throw broccoli and kale into the juicer. Instead, I tried to recreate a sort of light minestrone (without the beans and pasta) that I had several times on a trip to Bologna in 2010. Half a cabbage, finely shredded (I used a Sweetheart cabbage for this, but any of the firm green ones will do – you might try Savoy cabbage, for instance). Heat the stock to boiling in a large saucepan and throw in the carrots. Turn down the heat and simmer for five minutes. Then add in the peas and cabbage and simmer for another five minutes, or till the cabbage wilts. While you are cooking the vegetables, stir in a tablespoon of tomato puree and a teaspoon of marmite to season. Serve in two large bowls. Beat the dressing ingredients and mix with the shredded vegetables. This coleslaw is good with other salads, baked potatoes and baked sweet potatoes. Half a firm green cabbage (I used the other half of the Sweetheart), finely shredded. Heat some coconut oil, throw in the vegetables and stir fry till the cabbage wilts (not more than five minutes). Finish with a squeeze of lemon. Good with comfort food like mashed potato, carrot and swede and a couple of vegetarian sausages or vegeburgers.